The issue of gender equity in the screen industry has been featuring prominently in the global spotlight and Australia has joined this global movement and taking affirmative action. At the close of 2015, Screen Australia announced a five point, $5 million plan over three years for Gender Matters, initiatives that address the gender imbalance within the Australian screen industry. Since then, this $5 million Gender Matters plan has been refined and developed by an experienced Gender Matters Taskforce headed by Deanne Weir and including Queensland’s Emma Jensen and offers to female practitioners The Brilliant Stories Fund and Brilliant Careers. The Brilliant Stories Fund is a targeted initiative to recognise, celebrate and support storytelling by women. Screen Australia is looking for projects from teams that come from diverse backgrounds and that have bold, original and compelling story concepts. The fund is open and flexible. It encourages projects from all fiction genres (drama, comedy, sci-fi, horror, thriller, etc.) across any delivery platform and for any identified audience. up to $100,000 for feature fiction films to move a project from concept towards production. up to $50,000 for scripted television to develop an inventive concept of any genre into a series bible and/or series outline and/or first draft of a first episode script. up to $50,000 for scripted online and interactive to enable teams to realise their unique and compelling story concepts. All applications must be received by 4pm AEST QLD time (5pm AEDT) on Friday 18 March 2016. Final decisions will be made on Friday 24 June 2016. Applications for the Gender Matters: Brilliant Stories will be accepted through Screen Australia’s online application portal. Specific requirements apply where there is Indigenous community participation or content involved in a project. Please refer to the Screen Australia website. For further details on this program and eligibility, please read the Program Guidelines. Screen Australia recognises the importance and value of women in the screen industry, both in business and as storytellers. They also recognise that in order to make a real difference to women’s participation in the industry, there needs to be a holistic integrated approach to people, projects and business. 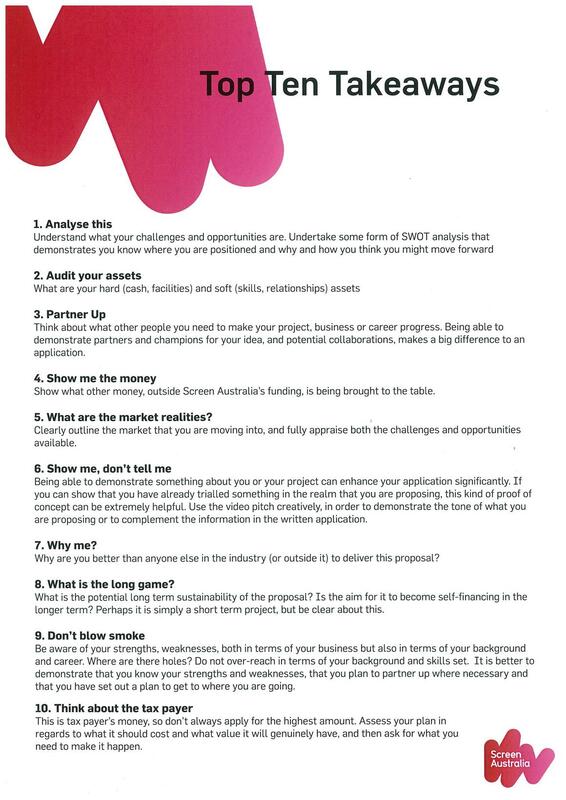 Screen Australia is looking for proposals that are strategic about the “big picture” connections between people, careers, projects, business, marketplace and audiences. You may request up to $250,000 per proposal. While this is the upper limit, Screen Australia encourages a range of budget sizes commensurate with the scale of your idea. A lower ask might make your proposal more competitive. Eligibility is open to companies, industry organisations and guilds that have the capacity to implement and deliver on their proposal. All applications must be received by 4pm AEST QLD time (5pm AEDT) on Friday 8 April 2016. Applications for the Gender Matters: Brilliant Careers will be accepted through Screen Australia’s online application portal. For further details on this program and eligibility, please click here. SQ is calling out to all female practitioners to collaborate and get involved with the Screen Australia Gender Matters program. We want to ensure that conversations, connections and working relationships are currently taking place in our local industry so that our female practitioners can take advantage of this progressive Screen Australia initiative. We would love to hear how you are tracking with your applications or if you need assistance from SQ with your application. Click here for some tips to get you on your way. please contact +61 7 3248 0500 or email the team here. Screen Queensland supports a creative, innovative and successful screen industry through development and investment; secures production to Queensland; and delivers an active screen culture across the state.